Carte d'Allemagne comprenant la Confederation Germanique l'Empire d'Autriche le Royaume de Prusse et le Royaume de Pologne. 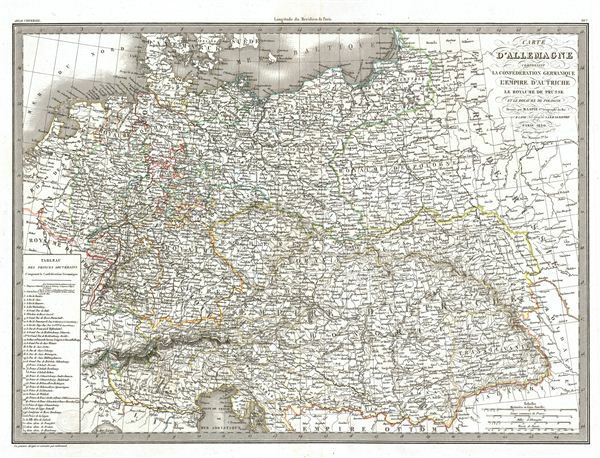 A fine first edition example of M. Lapie's 1831 map of Germany including the Germanic Confederation, the Austrian empire, the Kingdom of Prussia and the Kingdom of Poland. The map covers all of Germany, Poland, and Austria and the Germanic Confederation from the Baltic Sea to the Ottoman empire and from France to the Russian empire. The lower left corner of the map contains a table detailing the composition of the Germanic Confederation. Under the Holy Roman empire, the area was home to over 300 Kleinstaaterei, or city-states. When Napoleon defeated the Holy Roman empire at the Battle of Austerlitz in 1806, he condensed these states from 300 to 39. After Napoleon himself was defeated in 1814, the Congress of Vienna created The German Confederation to coordinate the economies of these separate but culturally related German-speaking countries. The Confederation acted as a buffer zone between Austria and Prussia, the two largest and most powerful member states. Nonetheless the rivalry between the two powerful states increased until it finally broke out into the Austro-Prussian War. Prussia won the Austro-Prussian War in 1866 which ultimately led to the collapse of the German Confederation. A few years later, in 1871, most of the former Confederation states were folded into the newly proclaimed German empire. This map was engraved by Armand Joseph Lallemand as plate no. 26 in the first edition of M. Lapie's important Atlas Universel. This map, like all maps from the Atlas Universel features an embossed stamp from the Lapie firm. Rumsey 2174.026. Phillips (Atlases) 754, 765.